Are you ready for smart dust, self-repairing walls, and living rooftops? Solar panels are undergoing rapid evolution in the last ten years. I’ve written about this in previous posts in the blog (see for example the forecast that we’ll have flying cars by 2035, which is largely dependent on the sun providing us with an abundance of electricity). The graph below is pretty much saying it all: the cost for producing just one watt of solar energy has gone down to somewhere between 1 percent and 0.5 percent of what it used to be just forty years ago. At the same time that prices go down, we see more installations of solar panels worldwide, roughly doubling every 2-3 years. Worldwide solar capacity in 2014 has been 53 times higher than in 2005, and global solar photovoltaic installations grew 34% in 2015 according to GTM Research. It should come as no surprise that regulators are beginning to take note of the solar trend. Indeed, two small California cities – Lancastar and Sebastopol – passed laws in 2013 requiring new houses to include solar panels on their roofs. And now, finally, San Francisco joins the fray as the first large city in the world to require solar panels on every new building. San Francisco has a lofty goal: meeting all of its energy demands by 2025, using renewable sources only. The new law seems to be one more step towards that achievement. But more than that, the law is part of a larger principle, which encompasses the Internet of Things as well: the Activation of Everything. To understand the concept of the Activation of Everything, we need to consider another promising legislation that will be introduced soon in San Francisco by Supervisor Scott Wiener. Supervisor Wiener is allowing solar roofs to be replaced with living roofs – roofs that are covered with soil and vegetation. According to a 2005 study, living roofs reduce cooling loads by 50-90 percent, and reduce stormwater waste and runoff to the sewage. They retain much of the rainwater, which later goes back to the atmosphere through evaporation. They enhance biodiversity, sequester carbon and even capture pollution. Of course, not every plant can be grown efficiently on such roofs – particularly not in dry California – but there’s little doubt that optimized living roofs can contribute to the city’s environment. Pay attention to the “activate our roofs” part. Supervisor Wiener is absolutely right in that the roofs are an under-utilized urban resource. Whether you want to use those roofs to harvest solar power or to grow plants and improve the environment, the idea is clear. We need to activate – in any means possible – our resources, so that we maximize their use. That is what the Activation of Everything principle means: activate everything, whether by allowing surfaces and items to harvest power or resources, or to have sensing and communication capabilities. In a way, activation can also mean convergence: take two functions or services that were performed separately in the past, and allow them to be performed together. In that way, a roof is no longer just a means to provide shade and protection from the weather, but can also harvest energy and improve the environment. The Internet of Things is a spectacular example for implementing the Activation of Everything principle. In the Internet of Things world, everything will be connected: every roof, every wall, every bridge and shirt and shoe. Every item will be activated to have added purposes. Our shirts will communicate our respiration rate to our physicians. Bricks in walls will report on their structural integrity to engineers. Bridges will let us know that they’re close to maximum capacity, and so on. The Internet of Things largely relies on sophisticated electronic technologies, but the Activation of Everything principle is more general than that. The Activation of Everything can also mean creating solar or living roofs, or even creating walls that include limestone-secreting bacteria that can fix cracks as soon as they form. Where else can we implement the Activation of Everything principle in the future? There have been many ideas to create roads that can harvest energy from cars’ movements. Unfortunately, the Laws of Thermodynamics reveal that such roads will in fact ‘steal’ that energy from passing cars, by making it more difficult for them to travel along the road. Not a good idea. The activation of roofs works well specifically because it has a good ROI (Return on Investment), with a relatively low energetic investment and large returns. Not so with energy-stealing roads. But there’s another unutilized resource in cars – the roof. We can use the Activation principle to derive insights about the future of car roofs: hybrid cars will be covered with solar panels, which will be used to harvest energy when they’re sitting in the parking lot, and store it for the ride home. Don’t get the math wrong: cars with solar roofs won’t be able to drive endlessly. In fact, if they rely only on solar power, they’ll barely even crawl. However, they will be able to power the electrical devices in the car, and trucks may even use solar energy on long journeys, to cool the wares they carry. If the cost of solar panel installation continues to go down, these uses could be viable within the decade. Farmlands are being activated today in many different ways: from sensors all over the field, and sometimes in every tree trunk, to farmers supplementing their livelihood by deploying solar panels and ‘farming electricity’. 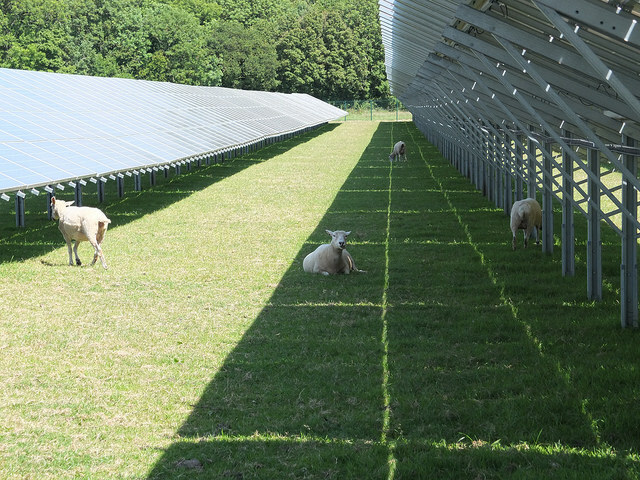 Some are combining both solar panels and crop and animal farming by spreading solar panels at a few meters height above the field, and growing plants that can make the most of the limited sunlight that gets to them. Even the air around us can be activated. Aerial drones may be considered an initial attempt to activate the sky by filling them with flying sensors, but they are large, cumbersome and interfere with aerial traffic and with the view. However, we’ll be able to activate air in various other ways in the future, such as smart dust – extremely small sensors with limited wireless connectivity that will transmit data about their whereabouts and the conditions there. Food is one of the only things that have barely been activated so far. Food today serves only two goals: to please by tasting great, and to nourish the body. According to the principle of Activation, however, food will soon serve several other purposes. Food items could be used to deliver therapeutics or sensors into the body, or possibly be produced with built-in biocompatible electronics and LEDs to make the food look better on the plate. As human beings, we’ve always searched for ways to optimize efficiency and to make the best use of the limited resources we have. One of those limited resources is space, which is why we try to activate – add functions – to every surface and item today. It’s fascinating to consider how the Activation of Everything will shape our world in the next few decades. We will have sensors everywhere, solar panels everywhere, batteries and electronics everywhere. It will be a world where nothing is as it seems at first glance anymore. An activated world – a living world indeed. A New Clean Energy Record Was Just Set in the U.S.